This summer I made it over to Berlin, for the a Open Knowledge Festival (#OKFest14). I was mainly there for the open education track, and to thrash out some ideas around approaches to staff development and open licensing. Click through here for a great round up of ‘Open Educating at OKFestival’ from Marieke Guy. Neelie Kroes delivered the keynote – ‘Embracing the open opportunity’, which argued that open approaches were critical to publicly funded bodies delivering on transparency, fairness and innovation. Tell me something about Diana Arce. I’m notorious for travelling at the drop of a hat based off a whim or a gut feeling despite the fact that I’m into organizing and planning most everything else. I’ve been doing this quite a bit over the last few years, taking my work with me and looking for new inspiration. It’s quite easy to do with less money than you think. I keep jokingly saying that I’m writing a book called Permanent Staycation to show people how to do this – which I should- but honestly, I’m quite clueless on how I pull this off and don’t really have time to write a book! Tell me something no one knows about Diana Arce. Some people know this but not many: I never intended to be an artist. Funny enough, I was studying law as an undergrad and my law professor soon-to-be mentor convinced me (although it was more like an ultimatum if anything) that I should focus my energies and interests in law and the social sciences into my artwork. Looking back, I’ve always been making political and cultural based work since I started out as an artist so I guess it was just a matter of time that I would end up working on something like AWAC. Who is AWAC? How did AWAC come into existence, and where is it heading? Last year I was invited to participate in Tactical Technology Collective’s Info Activism Camp. For the first time in my career as an artist I was surrounded by over 120 activists and organizers from across the world. Through my participation I realized there were many artistic projects and actions that many of the other participants didn’t know about and I offered to lead a short session to discuss possibilities of developing better collaborations between artists like myself with activists and organizations working to make the world a better place. During the session many of the other participants seeked advice and suggested to myself and another artist that we should form an organization to do this. At the end of the camp we announced Artists Without a Cause and a few months later we put together a basic concept. I begin filing the paperwork in Berlin to get us non profit status and researching potential collaborators and organizations we’d love to work with. It all happened quite quickly and many things changed during the first year. My original partner left to return to school and a few months before OKFest, Jeff Deutch and Brigid Pasco joined the team. I didn’t really realize it while it was happening, but it was a pretty amazing thing to conceptualize an organization, build it and complete our first collaboration within a years time. OKFest happened almost exactly 1 year after the Info Activism Camp. As far as AWAC’s plans for the future, we are currently talking to a few organizations about incorporating arts as a part of strategic campaigns. We are negotiating with several groups to tool kit Politaoke to make it available to organizers and Brigid is currently researching and developing a project regarding feminism and women’s rights which we hope to turn into a tour. I’m also giving a talk with Peng Collective, one of the artists we featured at OKFestival, at the #FixEurope Camp from European Alternatives this October. We’d like to connect with more organizations and discuss how working with artists can add to their campaigns! How did AWACs involvement in OK Fest 2014 come about? I was performing Politaoke at the Berliner Festspiele Theatre as part of the Net culture conference. I put together a program of speeches mostly from the Bundestag dealing with Chancellor Merkel’s phone being tapped by the NSA as well as a few of the greatest hits from the previous Politaoke iterations and Snowden’s Christmas address. It turned out that one of the participants was OKF’s own Beatrice Martini who was organizing OKFest. She wanted me to bring Politaoke and I told her about what we (which at this point consisted of only me) are trying to do at AWAC. I was then invited to be on the Program Team for the festival and after a few more conversations, Beatrice was convinced that artists should be a part of the festival and AWAC began putting together the plan of what artist participation could look like. 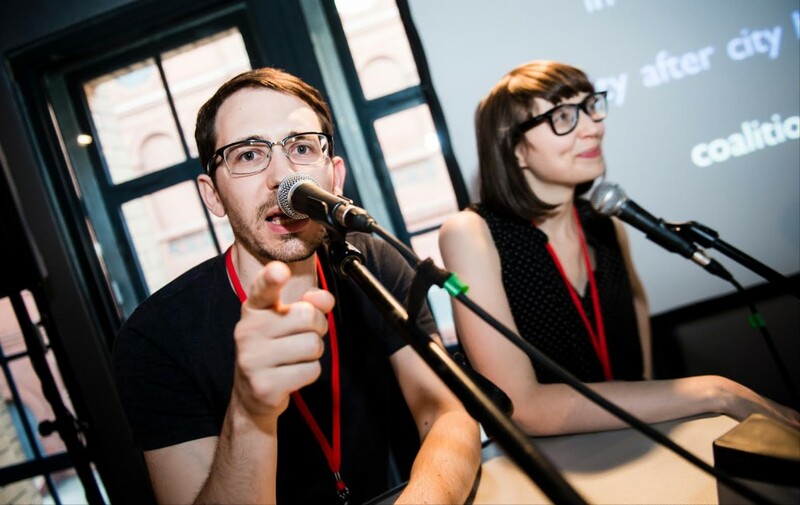 AWAC coordinated a range of sessions at OKFest14 – My favourite was probably the Political Karaoke session. I got to reenact a George W. Bush classic, although the best speech was a French one which seemed to mostly consist of enthusiastic applause from the audience. Tell me some more about the project? Can people get involved with the project or run their own political speech-offs? I began Politaoke in 2007 as an experiment to see what would happen if we could remove the politician from the politics. Would the words have the same impact? Would someone believe or back the words without the politician in front of it? Political engagement has been on the downturn for so long in the US yet people were willing to vote to pick their pop stars and entertainers in mass. Additionally, becoming a politician seems harder than ever; it’s grossly expensive and requires hundreds of people sometimes even on a local US scale. This seemed like a potential way to encourage people to participate by giving them the speeches as a tool, allow people to hear something more than a news media sound bite and have some fund at the same time. I work with contemporary speeches and try to create a program that is non partisan so people have the option of performing different political viewpoints. And it works just like a karaoke bar. There are books of speeches which the audience can chose from and when they come on stage they are played for everyone to see. I’ve toured the project throughout the USA, Canada, Germany and Israel (There are several interviews about the project available on our youtube and soundcloud pages where I go more in depth about the work). AWAC is currently working on turning Politaoke into a tool kit and training program that other organizations can use and expand upon for local use and are looking for support to do this. We also now have an instance set up on SayIt a platform created by MySociety to post open source transcripts online. Because many of the speeches we work with have no official transcripts, we’ve amassed a large collection that would be useful for other activists, organizations and artists. We want to make this available to the public. I loved the way that artists and musicians played such a prominent part in the OKFest 2014 Programme. The approach achieved a couple of things: one, it made sure that creativity and art was as much a part of the event and the definition of open as data, science, education, government, and two, the artists provided opportunities for all attendees to engage with art and art practice. This in itself was a lovely thing, but I also think it helps practically encourage people to recontextualize, to open up :), their own viewpoints and approaches. Is that anything like your experience of how artists were included? Or your interpretation of what the impact was? I completely agree with you regarding the experience. I’d like to think that artists are the next phase of data visualization – more like data dramatization per se. It was an amazing experience to see and meet so many people focused on making information open, available and transparent. We were there to help show how all this work can be presented and brought to audiences face to face, especially those who don’t know what it is or why it’s important. The more we can encourage the public to understand the importance of this work, the better it is for the people and organizations doing the work. Typically conference organisers don’t make integrating creative practice and opportunities into the schedule a priority in the way as OKFest did. Is this the kind of thing AWAC is interested in doing – working with conferences and event organisers? Or was it a one off? We were truly excited and proud to be a part of OKFest. I definitely have to give their organization many thanks for trusting that our vision for how to incorporate artists into the festival would be representative of this year’s theme open minds to open action. We were able to develop the project like a festival within a festival, from conception through production, and the OKFest team did a great job of presenting the projects as an integrated part of the festival. This format was helpful as it also alleviated any potential extra strain on the OKFest team and allowed us to manage the artist sessions with speed and ease. We believe this is a fantastic way for conference and event organizers to work with us and we’d love to help other groups make this possible. Tell me a bit about the other sessions AWAC coordinated? Or point up a couple of your favourites? I can’t really pick a favourite! If I didn’t love the work that these artists have been making, I wouldn’t have asked them to be a part of the festival! It’s amazing to see the different genres and methods of each of the artists could bring to the table and their contributing sessions are only a small glimpse into the body of work they’re creating. I truly enjoyed Ingrid Burrington and Josh Begley’s ability to deconstruct complex data sets in order to make them into a tangible story. Peng Collective is able to use humour and research in order to create interventions and point out issues to large audiences. 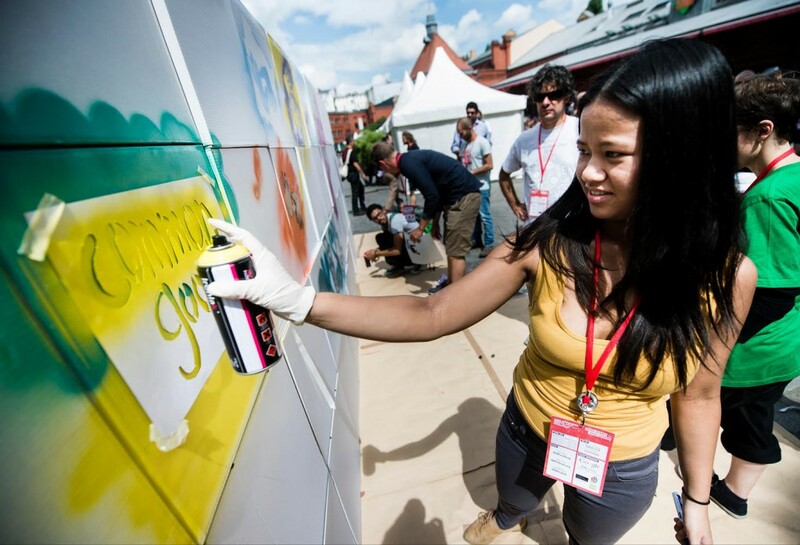 The Spray Uzi Crew are amazing graffiti artists whose work is often more effective in reaching people than more traditional forms of outreach. And Juliani and Valsero’s musical talents are only topped by their political knowledge which they incorporate into their art. It’s amazing to know and work with so many people who are using their gifts for engaging and activating many people to question and look at many aspects of their environment differently. Again – huge thanks for your time Diana! Was brilliant to meet you and Brigid and Jeff – thanks for making OKFest14 so fantastic.